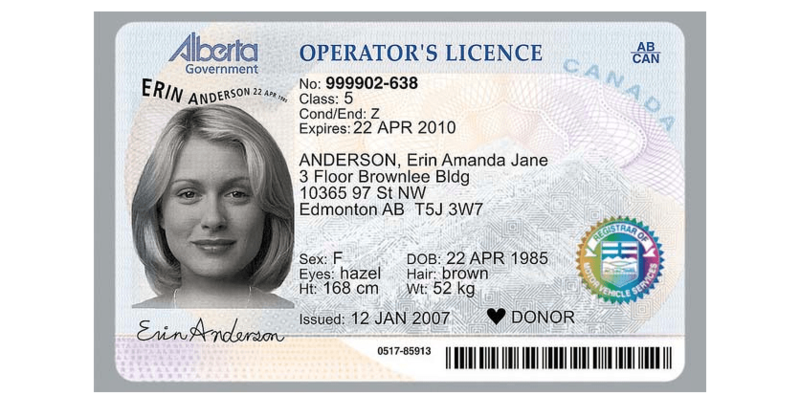 In Alberta, there is a Graduated Driver Licensing Program to get a license, regardless of age. This GDL program aims at giving all drivers the skills, support, and experience they need for driving safely. It also improves road safety by creating a controlled and safe driving environment for all drivers. As a new driver in Graduated Driver Licensing, you may have either the learners Class 7 or the stage 2 class 5 probationary license. First of all, before you get any license in Alberta, you may have to take the knowledge test for driver licensing. You may take this test at a registry agent office and the fee is $17. Out of 30 multiple choice questions, you must get at least 25 answers correct. A class 5 license lets you drive trucks, vans or cars without supervision. Pass the road test after you schedule a road test at one of the registry agent offices. Test and pass your vision at one of the registry agent offices to check if it is good to drive safely on the roads. Buy the class 5 (GDL) license card if you pass the vision test and road test. In order to get a class 5 driver license, you must have class 5 GDL license for a minimum of 2 years. This should be without any suspensions in the past year. To get full class 5 license, you must be at least 16 years old. If you are less than 18 years then you must have your guardian or parent’s consent in writing. You must have had minimum 1-year driving experience. You must have a permanent residence, citizenship, work visa or approved refugee status from Canada with valid ID. It is also necessary to have residence proof in Alberta, Canada since you are applying for a license in Alberta. The cost of a class 5 license that has a validity of 1 year is $21. For 2 years, the same license will cost $37 and for 3 years, the class 5 license will cost you $53. You may pay $69 for class 5 license with a validity of 4 years. A class 5 license with validity for 5 years may cost $84. You must hold the probationary class 5 license for at least 2 years. The number of passengers must not be more than the number of seat belts. You may not be able to re-class your class 5 license to commercial driver classes 1,2,3,4 etc. During the probationary period, they may suspend your license if you accumulate 8 or more demerit points. In Ontario, the equivalent of a class 5 license is G class.